The Jetsons & WWE: Robo-WrestleMania! (2017) Review – AiPT! It seems like just yesterday I had the confounding privilege of reviewing a direct-to-DVD crossover between the Flintstones and the WWE. And now, I get to experience its spiritual successor: The Jetsons & WWE: Robo-WrestleMania! Who makes these things and why? Well, the answer to the first question is Hanna-Barbera and by extension the Time-Warner Corporation, so that’s one mystery solved. I’m still working on the “why” part, however. These films have been part of a larger marketing co-promotion between Hanna-Barbera and the WWE and, as a matter of fact, in the time it took my brain cells to grow back after that Flintstones one, the WWE crossed over with Scooby-Doo. Twice! But I won’t be reviewing those films because I’ve heard they’re kind of good. And it’s not my job to watch good things. While on his way to claim the title of WWE World Heavyweight Champion, Big Show is frozen in a block of ice. He his thawed out a century later by George Jetson and immediately goes about trying to earn his title. Big Show easily conquers the robot wrestlers of the future and soon sets his sights on the next logical step: Conquering the world! To defeat Big Show, George and his family will have to use Elroy’s time machine to travel back to the 21st century and recruit a team of WWE Superstars: Roman Reigns, Seth Rollins, Alicia Fox, the Uso Brothers, Sheamus and Vince McMahon. Go back and read that plot summary again. It’s like the diary of a madman. Also, who ARE these people? God, I’m out of touch with wrestling. Whenever I tune into something wrestling-related, I instinctively think I’m going to be seeing all my childhood favorites: Owen Hart! Yokozuna! Junkyard Dawg! Ultimate Warrior! Rowdy Roddy Piper! Superfly Snuka! Mr. Fuji! But they’re all DEAD! Seriously, half the roster of Hulk Hogan’s Rock ‘n Wrestling is suplexing the grave. That’s a sobering reminder of your own mortality if there ever was one. At least Iron Sheik is still hanging in there. So I couldn’t be more disconnected from modern WWE shenanigans. Luckily, I’m well-acquainted with The Jetsons. And you want to know one of the nicest things about s----y, cost-efficient, half-assed Hanna-Barbera cartoons? They never change. You can always rely on The Jetsons to run through all their tired catchphrases (“Jetson, you’re fired!”) and provide groan-inducing space-puns (“Vince McMoon”). So at least I was able to relate to half of this crossover. Unfortunately, it was the f-----g Jetsons. Well, let’s talk about the plot. The Flintstones/WWE film had a conspicuous lack of one and therefore ended somewhere around 55 minutes. The Jetsons/WWE flick actually has a plot with a three-act structure and everything, so there’s a genuine story to follow throughout the film. The downside of that is the movie winds up being nearly feature-length, clocking in at around 80 minutes. That said, the genuinely insane story about a pro wrestler going mad with power and conquering the future (which is full of pacifist wimps), thus requiring the Jetsons to travel back in time and recruit more wrestlers to stop him… well, it’s kind of entertaining if only by virtue of how weird it is. Maybe part of it is my lack of familiarity with these more recent WWE personalities, but I don’t know who is a face and who is a heel. So everything that happens feels spontaneous and inexplicable; it’s hard to predict the story beats. While I do think it stretches what it has out a little too far, the movie does keep you on your toes. On The Jetsons side of things, the writers do mostly what they did with The Flintstones crossover and stick to the classic shtick. All the humor is very muted and corny and several gags are lifted directly from episodes of the ancient TV series. It’s kinda charming in a way, and it only helps to exaggerate the juxtaposition of these two polarizing properties as they crossover: A mundane ‘60s sitcom being invaded by lunatic pro wrestlers. There’s a bit where they redo the theme song midway through the movie, but the character roll call of the Jetsons is replaced with the WWE stars as they hover around in space pods. Also, I guess it’s worth noting that I think, THINK, this is the first time in anything Jetsons-related that we have ever seen on the surface of the Earth. There go those fan theories about the Flintstones living down there, rebuilding society after a nuclear Armageddon while the wealthy elite flourish above the mess in their luxury skyscrapers. The animation isn’t quite up to what we got in the Flintstones one, which wasn’t hot s--t to begin with. Actually, I don’t think it’s even really the animation quality that stinks, but that director Anthony Bell just doesn’t get very nutty with his character designs or timing or anything. The movie looks very slow, save during some of the wrestling action sequences, but even those have a clumsy, listless feel to them. That Flintstones one wasn’t top of the line animation, but directors Spike Brandt and Tony Cervone were willing to get a little crazy here and there. Still, it’s probably the nicest the Jetsons characters have ever looked in animation. Yeah, I’d say it’s easier on the eyes than 1989’s Jetsons: The Movie, if only by virtue of not having any animation from Glen Kennedy. If you know who I’m talking about, I guarantee you want to strangle him, too. The voice cast contains a lot of the same people who were in the Flintstones/WWE flick, but now they’re trying to do Jetsons impressions. Jeff Bergman provides both George Jetson and Mr. Spacely, both of which are roles he’s had since the ‘90s (he actually filled in for George and Spacely in part of the ’89 movie because their original actors died midway through recording). Bergman’s Spacely sounds alright, but man oh man is his George Jetson ever out of practice. Honestly, I don’t know when the last time he voiced the character was; I thought it was in Harvey Birdman: Attorney at Law, but it turns out that was Wally Wingert as George Jetson. His Fred Flintstone was way better than this. Grey Griffin takes over as Jane and she does an alright take on the character, even if it sounds less like an impression and more like her usual voice. Danica McKellar’s Judy is more on the mark, albeit this take on the character is a little less swoony. She’s better than Tiffany, anyway. Trevor Devall absolutely freakin’ nails it as Elroy, so the cast has that going for it. And then there’s Tress MacNeille as Rosie and Frank Welker as Astro, both of whom I think have been playing those parts for a long time, but they pick their roles back up with much more ease than Bergman’s George. Alas, Orbity is nowhere to be found. Or perhaps not alas. Because f--k Orbity. The WWE Superstars all play themselves, naturally, and while some don’t take to voice acting as well as others (Seth Rollins), it actually SOUNDS like they’re having fun in the movie. They aren’t afraid to get silly, either, as they all play monotone robot counterparts of themselves as recurring henchmen. Even Big Show gets some goofy nonsense in as he’s intimidated by Rosie and tries to figure out the future technology. It’s a much larger cast than the Flintstones/WWE film, and while a lot of these wrestlers visually start to blend together (so many dudes with long dark hair, beards and black singlets), the face characters aren’t as dull this time around. Look, I don’t know what I was expecting from this thing. I want to hate it, but it’s just so weird I don’t think I CAN hate it. There are only a handful of good jokes in the movie and the animation is a bit too bland (well beneath Warner Bros’ recent DTV Scooby-Doo stuff), but the novelty is enough to give it legs. I do think kids, especially kids that are into WWE, will enjoy the film. So in that regard, who am I to condemn the movie? 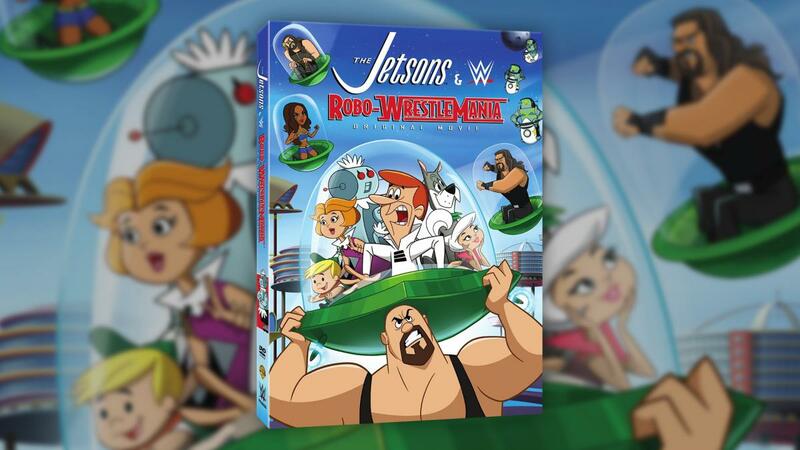 The Jetsons & WWE: Robo-WrestleMania is EXACTLY what the title promises. And with a title like that, it’s sort of amazing.